Our range of products include electronic coil scale. Electronic Coil Scale is engineered to weigh coils operated by overhead cranes. These scales are provided to take heavy loads continuously. The coil saddle with wooden top, protects the coil with a soft base, during loading on the scale. 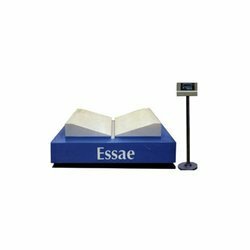 Electronic Coil Scale can be directly placed on the existing floor and can also be shifted wherever necessary. The indicator can be mounted on a pole or on the wall and also can be interfaced with the computer. The Coil Scale offers the customer the same load cells that Weigh - Tronix Inc., USA uses for its scales. Heavy duty load cells and bending type weigh bars imported from Weigh-Tronix Inc. USA give perfect accuracy & reliability for years. The microprocessor based electronic indicator is an extremely reliable and user- friendly weight indicator with a green vacuum fluorescent display. The platform of the truck scale is robust to harsh environmental conditions. Depending on the space available, the customer is free to choose either a Surface Mounted Truck Scale or a Pit Mounted Truck Scale. Heart of any electronic weigh scale, the load cell is heavy duty bending beam type load cell. The simple, compact design and rugged hermetically sealed construction of the load cell assures long life. The technologically advanced link & link pin mounting arrangement of the load cell ensures longevity and smooth performance of the load cell. WeighSoft Enterprise handles the process of weighing material. The application enables you to capture weight data, print weight tickets and reports. It stores the weight data for future processing and reporting. Weigh soft enterprise is simple to use and extremely user friendly. The main screen allows you to navigate to various functions, with the help of buttons and menus. Looking for Electronic Coil Scale ?